This week I am in the Argentine city of Salta, on the edge of the Andes, and I have found another great place for hill running. Just eight blocks east of the city centre is Cerro San Bernado, a tree covered hill with a couple of great running routes to the top. If you're feeling lazy then head to the end of Avenue San Martin and take the teleferico to the top. There is also a quiet road winding up to the top, with very little traffic, but I took the fun running option. Head out of town on General Guemes, to a semicircular park with a statue of the general and horse atop a massive pile of boulders - you can't miss it. 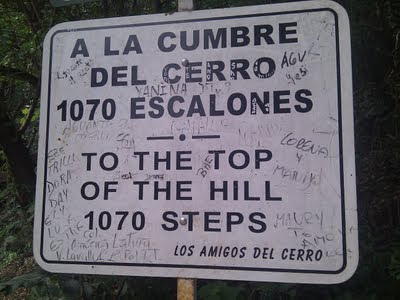 Note this route up is not near the base of the teleferico - don't head there if you want to run up the steps. 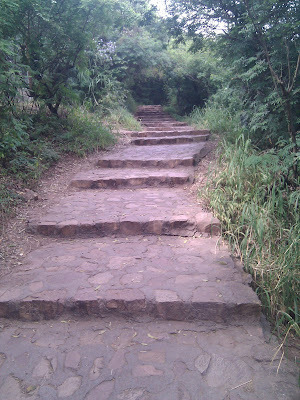 Did I mention the steps? Keep going directly behind the statue, cross the road and after a few more steps you should see this sign. 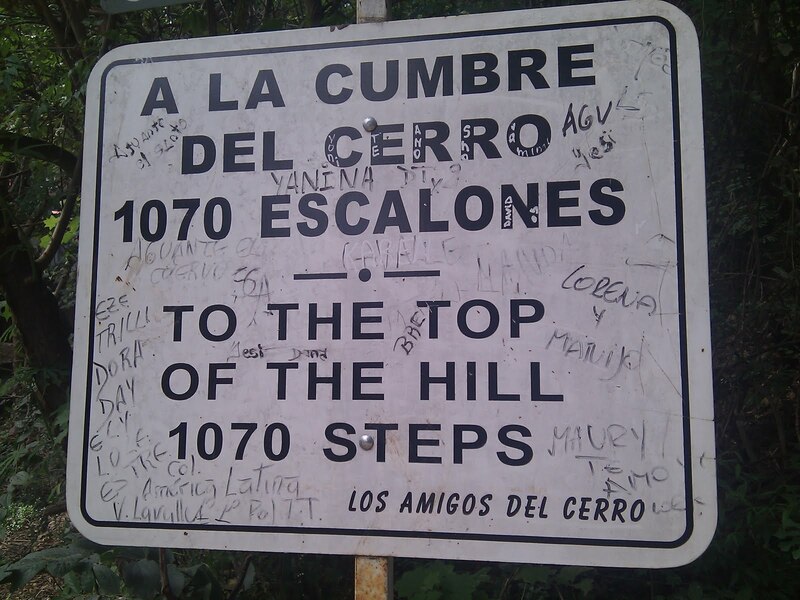 Yes, just 1,070 stone steps to the top. The path zig zags directly up the side of the hill, always enclosed in trees, providing welcome shade and with glimpses of the view of the city, which just keeps on getting better as you ascend. The path is well built, with flat stone steps in good condition, but the step length keeps changing which really breaks your stride, requiring plenty of concentration. I couldn't quite run this one all the way, slowing to a walk a few times to prevent my heart from exploding. The trees were full of colourful and noisy birds, distracting me from the effort, and there were plenty of other runners and walkers about, showing varying degrees of exhaustion. Just over 800 steps into the climb, there is a brief respite along the road, and then back onto the steps for the final push to the top. The final part of the route is alongside and then through a wonderful waterfall system which I can only describe as a man-made attempt at a miniature Iguazu Falls! Lunch at the top was superb - some of the best empanadas I have eaten in Argentina, accompanied by a view across the entire city grid and into the Andes in the far distance. The day was sunny but with a thick haze. The lemonade (actual lemon juice and sugar) was an amazing thirst quencer. Running back down was fast and fun, but requiring full concentration for the ever changing steps and twists and turns. 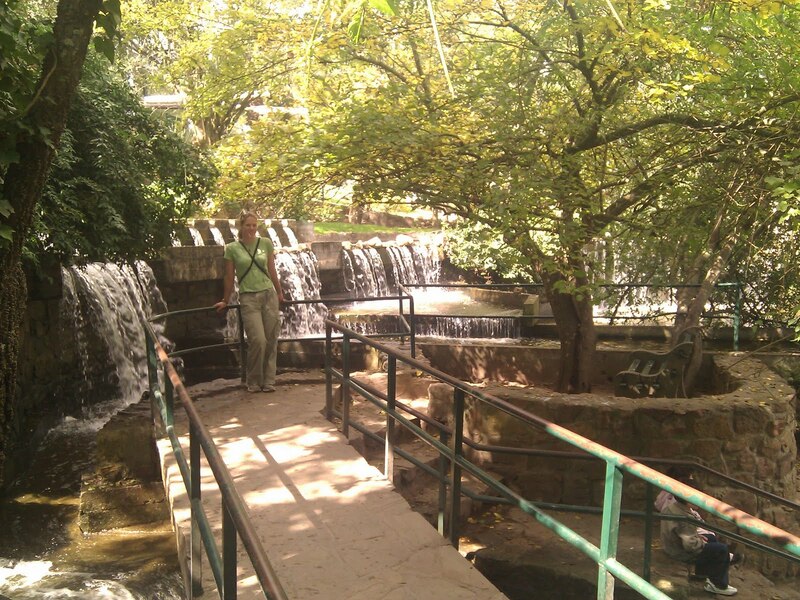 I am staying at the lovely Hostel Las Rejas in Salta, which I highly recommend. They were very welcoming, friendly and helpful. No more running here as I'll be taking the train to the clouds up to 4,200 metres next.